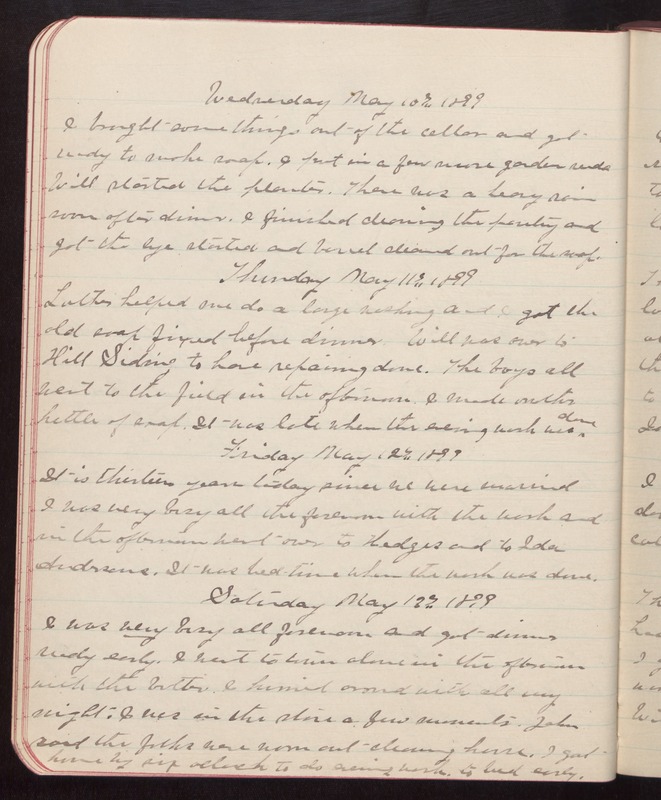 Wednesday May 10th 1899 I brought some things out of the cellar and got ready to make soap. I put in a few more garden seeds Will started the planter. There was a heavy rain soon after dinner. I finished cleaning the pantry and got the lye started and barrel cleaned out for the soap. Thursday May 11th 1899 Luther helped me do a large washing and I got the old soap fixed before dinner. Will was over to Hill Siding to have repairing done. The boys all went to the field in the afternoon. I made another kettle of soap. It was late when the evening work was done. Friday May 12th 1899 It is thirteen years today since we were married I was very busy all the forenoon with the work and in the afternoon went over to Hedges and to Ida Andersons. It was bed-time when the work was done. Saturday May 13th 1899 I was very busy all forenoon and got dinner ready early. I went to town alone in the afternoon with the butter. I hurried around with all my might. I was in the store a few moments. John said the folks were worn out cleaning house. I got home by six oclock to do evening work. to bed early.